Where do I use my Shedstore voucher code? You can discover a huge array of sheds at Shedstore in an array of sizes and materials including wood, metal and plastic. Discover potting sheds, corner sheds, pressure treated sheds, tongue and groove sheds, garden workshops and garden shed accessories. Other storage options including garden storage boxes, bike storage, log stores, wheelie bin storage, storage benches, tool storage and cushion storage as well as wooden, metal and motorbike garages. If you’re looking for something more lavish you can also find forest and Palmako log cabins and contemporary, corner, octagonal and traditional summer houses. As well as all this at Shedstore, you can find an array of fencing and gates as well as various gardening products like garden tools, wheelbarrows, water features, grow your own products, different types of greenhouses, chainsaws and trimmers. If you’re looking for garden toys or playhouses you can find wooden and tower playhouses, climbers, slides, sandpits, play tables and garden games. If you’re shopping on a budget you can check out the sale section where there are tons of discounts and offers that can help you save money on all the products previously listed. In the fencing and gates section, you can find feather edge, close board, post and rail and DIY fencing as well as cheap, wooden, decorative, lattice and pressure treated panels, plus border edging. You can also find diamond, fan, lattice, rose and square trellis as well as concrete, round and wooden fence posts, post spikes, post caps, clips and fixings and fencing accessories. In this section, you can also find a variety of affordable wooden gates for both your front and back garden, available in many different sizes and colours. If you’re looking for outdoor living products or structures and features you can find wooden gazebos, pergolas, arbours, garden arches, decking, verandas, awnings, chairs, patio furniture, solar lights and much more at Shedstore. If you are redesigning your garden or are looking to freshen it up then the outdoor living section is the perfect section to browse through. With so many products available, you can add a touch of style to your garden without spending a fortune on major construction or landscaping work. From garden furniture to abours, decking kits and decorative stones, you can find all the products needed to create a relaxing and interesting outdoor environment at Shedstore. Shedstore is the UK's garden sheds expert and leading online retailer of quality and value garden sheds, garden storage, summerhouses, log cabins, greenhouses, and playhouses. Shedstore offers one of the largest selections of garden buildings and storage products on the web, sourced from the UK's top manufacturers. 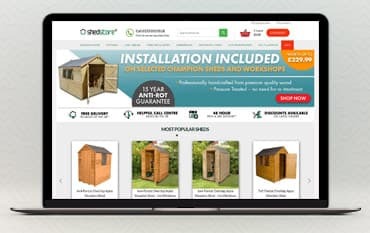 Shop online at Shedstore with a discount code from us and save money on a wide selection of products, and with a price match guarantee and a great sale section, you are sure to pay an affordable price for all your garden storage products.